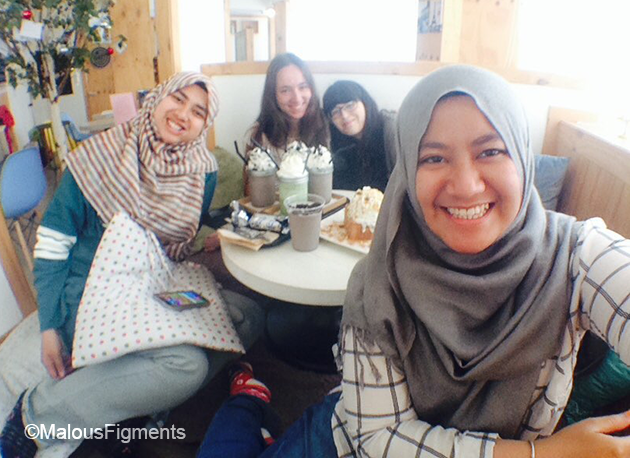 So we went there, met one of Alya’s friends who is also from Malaysia, ate lunch and moved on to a dessert. I mean, I only still eat proper food so that I can eat dessert afterwards (duh). Desert is often either ice cream, waffles with ice cream or a piece of cake/mouse/chocolate. In the last few days, I have eaten a lot of Oreo desserts. We ordered Cookies and Cream Frappuccino’s which in Korea often means that you get ‘Oreo’ Frappuccino’s. As for a cake, we decided on a Hunny Caramel cake and wow… you have no idea how sweet it is! Koreans seem to love sweet. There is their bread for example. Don’t expect to get ‘normal’ (Dutch/German) bread. The bread in Korea is very sweet… it tastes more like a semi cake. Maybe it is because Alya has already been in Korea 4 times. She seems to know a lot of good places for food and desserts. She brought us to a place with an entrance we would have passed by ourselves if it wasn’t for her and you know… it is not a place that you want to miss out! The places to sit are separated from each other. It gives the impression that you are ‘alone’ with you and your friends while you sit on a soft carpet and can lean against big pillows. It’s very cozy and makes you feel relaxed while you enjoy some delicious Frappuccino and cake. The hours were passing by without notice. Then at one point, Alya said she was not happy with having to see the monkeys again. Another time, Tira decided to go jogging and chose to wear a red shirt that day. She expected goats on her way, in the worst case. When she reached the playground she didn’t encounter goats but cows instead… They were looking very intensely at her red shirt. Both Alya and Tira are going back to Malaysia within less than a week. “Come to Malaysia!” They have urged us many times already. I’d love to… if they can keep me safe from the monkeys, goats and cows. We can video chat with them first and when we do we might be able to see monkeys in the background.